Airport Transportation, limo rent, airport limousine service, Car Service Delhi, Town Car, Airport Shuttle, wedding limos in Chennai, Cheap Limo Services, Ground Transportation, BWI Limo. 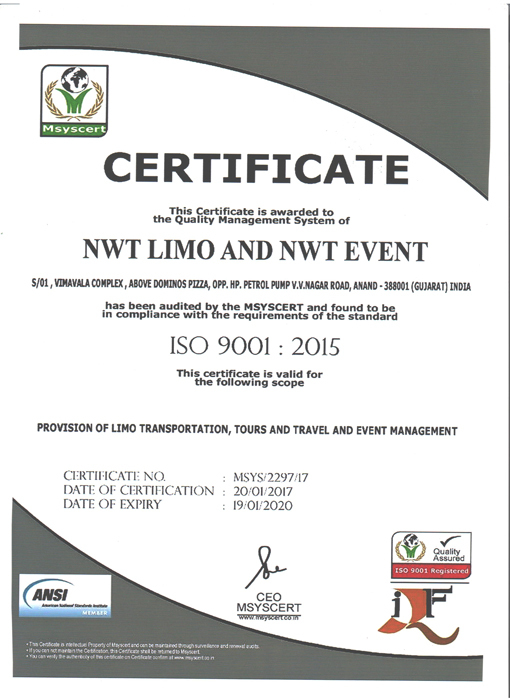 NWT Limo is the first class provider of luxury Car Rent, Limousine and event transportation services in all over india. As a service based business, we have built our company one costumer at-a-time. We are committed not only to providing excellence on a daily basis, but to continue to work hard to maintain the level of customer service, reliability and quality that have kept us in the forefront of Car Rent industry. We have a vast knowledge and capacity to arrange transportation for small and large number of passengers to and from airport, resorts, corporate events, sightseeing, night on the town, sports events and to and from anywhere in the India. Whether a car is required for an hour, a day, a week or a month, NWT Limo provides the highest possible standard of service and the most affordable rates. NWT Limo employs an elite staff of highly trained, experienced and knowledgeable professionals, who are ready to serve you 24x7 hours days a week. Each chauffeur will be equipped with the proper instructions of each pick up and destination by our state-of-art technology capabilities. All our clients will be met personally by our well professional chauffeurs, creating the right image for visiting VIPs. Our fleet of new, clean, well-maintained, fully licensed and insured vehicles, guarantee the best quality Car Rent, Sedans and limousine in India.